Currently, the figure known as “Grant (Quentin) Douglas/Collins” is in a state of post-structuralist amnesia, destabilized and decentered by a critique proposed by Barnabas Collins in the form of a car accident. Dizzy with head trauma, like all great postmodern thinkers, Grant/Quentin rejects the existence of objective reality and absolute truth. This is extremely frustrating for everyone around him, especially his parents, who sent him to college for four years and now all he can do is textual analysis, which is not a marketable skill. His new volunteer landlady is Olivia (Amanda) Corey, an actress who displays several framed photographs of herself in her hotel room, as a challenge to the rigid syntax/semantics of self. Amanda is a unique expression of the tension between signifier and the signified — an oil painting that walks the earth, renaming and reclaiming her identity. Amanda/Olivia: I’m trying to convince myself that it isn’t a dream. Quentin/Grant: What are you talking about? Amanda/Olivia: Have you no memory at all? Quentin/Grant: Listen, I don’t even know whether I’m right or left-handed. Amanda/Olivia: My face isn’t familiar to you? Now, in the post-structuralist approach to textual analysis, the reader replaces the author as the primary subject of inquiry, and why not? The reader is easier to talk to, and has more free time. In this storyline, the protagonist has a stated goal — to remember who and how old he is, and whether he’s right or left-handed, apparently — but he shows no real interest in working towards that goal. He’s skeptical, detached. The figure who should have authoritative control over his own name and history has abandoned ship, replacing the traditional (first-order) language of self with an inconsistent series of shrugs and wry facial expressions. He’s an amnesiac who’s given up on remembering the past, challenging the past to remember him instead. Grant/Quentin: Now, look, it’s not that I don’t appreciate your help. It’s just that I’m in no condition to be bothered by guessing games. Olivia/Amanda: We’re not playing a game! Grant/Quentin: Then what are we playing? You brought me here for a reason! What is it? Olivia/Amanda: This may sound strange… but when the time comes, you won’t have to ask me that question. You’ll know. Grant/Quentin: I really don’t think I like this. I mean, right now, my life is pretty much of a mystery. I don’t think it would be good to confuse things even more, by letting you add more mystery to it. The “Quentin” figure in this exchange proposes that there is a quantifiable amount of “mystery”, a substance that can be increased by adding “more mystery”. He refuses to see that “more mystery” could unearth more clues, which would further the dominant hierarchical goal of assigning singular names to soap opera characters. Quentin/Grant does not agree with this goal; he is a text that does not want to be understood, and defies attempts to decode it. “What are we playing?” he asks. What indeed. The only way to approach this storyline is to turn it into self-immolating discordian trickster jargon, also known as literary theory. Am(olivi)anda: I have a good reason, and when you know what it is, you’ll understand. Gra(Que)nt(in): Look — you don’t seem to realize what an impossible task you’re undertaking. I have no identity. I’m a nobody. And it’s going to take a lot more than your good intentions to change that. Am(olivi)anda: Well, that’s not quite true. The identification that you carry with you says that you’re Grant Douglas — but on the other hand, there are at least two people who think you’re really Quentin Collins. In other words, commonsense meanings are not givens, but are shaped by ideological forces. Amanda is suggesting that the binary opposition of Quentin/Grant could be resolved by popular vote, with “at least two people” on one side of the debate and “the identification” on the other. But Quentin, as a post-structuralist discordian, resists all ideological formulas. He doesn’t pick a side in the conflict between Quentin/Amanda and Grant/Olivia. He is inherently transgressive, if the word “inherently” means anything in this context, which it doesn’t. Nothing does; that’s kind of the point. Meanwhile, the other local trickster is conducting her own war against the attribution of meaning to individual signifiers. Dr. Julia(n) Hoffman, a cross-discipline aesthetic mendacitist, is currently interrogating an oil painting, looking for hidden structures that reveal absent signifiers and aberrant decoding. Julia: When I went to the hospital to get Grant Douglas, he refused to come with me. He said he didn’t want me to treat him anymore. Chris: Why? If he has amnesia, why should he turn you down? Julia: He left with Olivia Corey. Chris: Olivia Corey… I don’t get it! Why is she so interested in him? Julia: She must either know — or suspect! — that he is really Quentin Collins. It’s telling that she puts the dramatic stress on the phrase “or suspect!” rather than the knowledge itself. To Dr. Hoffman, it’s the existence of suspicion! that is itself suspicious. Anybody can know something. It’s the act of suspecting! that reveals a new range of discursive positions. Now, to understand this plot point, we need to discuss deconstruction, a post-structuralist strategy for textual analysis developed by Jacques Derrida. I’m not sure why ABC decided to host this graduate seminar on literary theory in the middle of the afternoon for an audience of housewives and middle-schoolers, but that was their decision, and there’s nothing we can do about it now. The point of deconstruction is to dismantle the rhetorical structures within a text, to demonstrate how key concepts within it depend on their unstated oppositional relation to absent signifiers. For example, the Charles Delaware Tate painting that Julia bought at the antique shop is generally assumed to be a landscape, populated by simple, commonsense signifiers such as “lake”, “trees” and “mountains”. But Julia knows that there are hidden structures within the text that can be revealed by careful analysis, in this case by an X-ray. As with all insights gained through literary theory, this is impenetrable and essentially useless, except to other academics. So when Chris asks how they can discover whose portrait is under the landscape, Dr. Hoffman says, “I can think of only one man to ask.” That one man is Professor Timothy/Eliot Stokes, a P.T. Barnum-style academic huckster who claims expertise in practically every field at once. 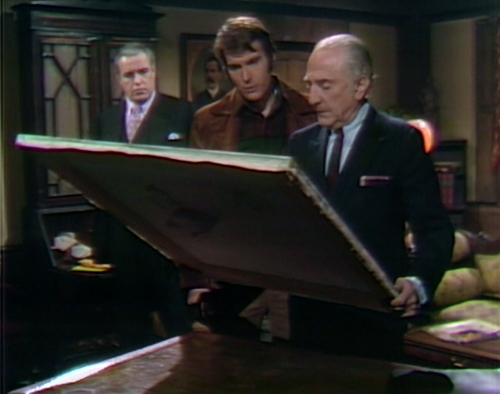 Julia: Do you remember the Charles Delaware Tate that I bought last week? 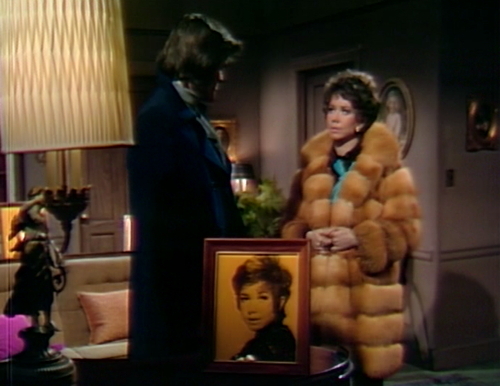 Julia: Well, I have discovered that there’s another painting under it — a portrait! Julia: Now, what I want to know is: is there any way of removing the top layer without damaging the second layer? Stokes: Yes, it’s quite possible. I’m not competent to do it. Julia: Well, do you know anyone who is? Stokes: Henry Osmund at the University is an expert in that sort of restoration. Julia: Could you possibly call him, and ask him if he’d be willing to help? Julia: Yes. I’m sorry to say so, but it is terribly important. So the trickster professor of indeterminate expertise brings in a subcontractor from the University, who’s available at all hours for emergency analysis. This is a post-structuralist professor’s fantasy come true — the opportunity to look intelligent by standing next to other people’s work. While Dr. Hoffman suggests that there’s a single objective truth — an ultimate resolution of the binary opposition posed by “portrait” and “landscape” — she is mediating that subject-position through three levels of academic analysis, which ought to be enough to obscure any useful fact-finding that might come up accidentally along the way. She must either know — or suspect! — that the subject has no existence outside specific discursive moments. In his 1967 essay The Death of the Author, Roland Barthes says, “A text’s unity lies not in its origins, but in its destination.” In other words — and you have to put it in other words, to get anything out of it — you can interpret a text from several alternative subject-positions, which may not have been intended by the original creator. In this case, the issue isn’t so much the death of the author; it’s the death of the painter, Charles Delaware Tate, who decided that this portrait would look better with a lake painted over it. Is there a single answer to the question of what is underneath the painting — or is there another painting that can be revealed under that, and another? 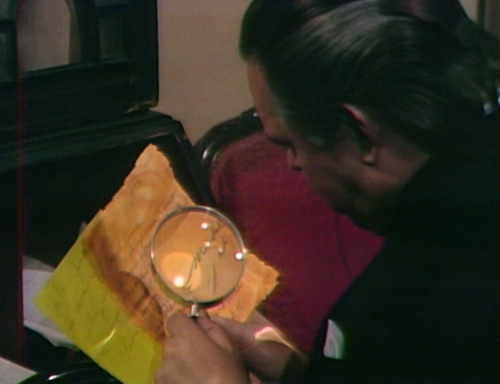 As Grant Douglas says, in the five-year-long critical analysis known as Dark Shadows, “I don’t think it would be good to confuse things even more, by letting you add more mystery to it.” Unfortunately, more mystery is all we can offer. That’s the only thing literary theory is good for. Tomorrow: Episode 911 Is a Joke. 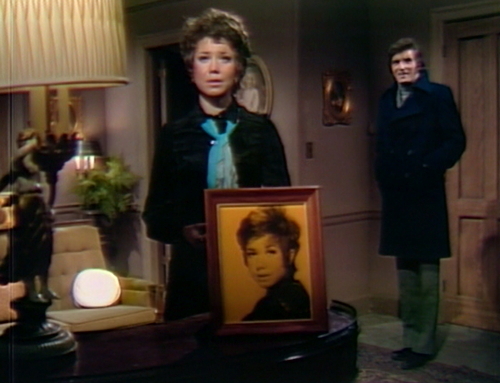 In act one, switching from Olivia’s room to the Collinwood foyer, we see Liz standing at the top of the stairs for a moment, waiting for her cue to descend. When Quentin tries to remember a song, there’s a loud clank from the studio. 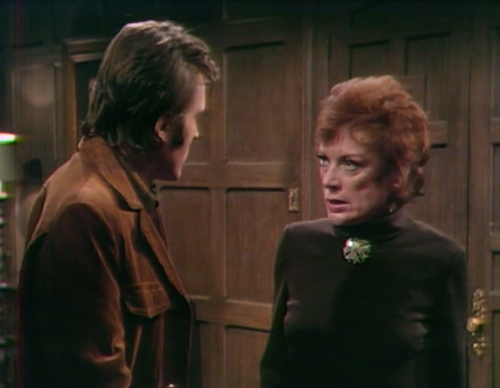 In act 3, Quentin opens the door for Julia so that she can exit. The scene shifts to Stokes’ house, but we hear the door of Olivia’s apartment slam as Quentin closes it behind him. We see Stokes’ house today, which is usually made up of bits from other sets. The “Smith Brothers” portrait of a man with a large mustache is on the wall. I think the big round mirror is in a different place than it was back in the days when Stokes used to entertain Adam. And there’s a yellow chair at the desk that I don’t think we’ve seen before — yellow appears to be the fashionable color for December 1969; we’re seeing a lot of yellow these days. 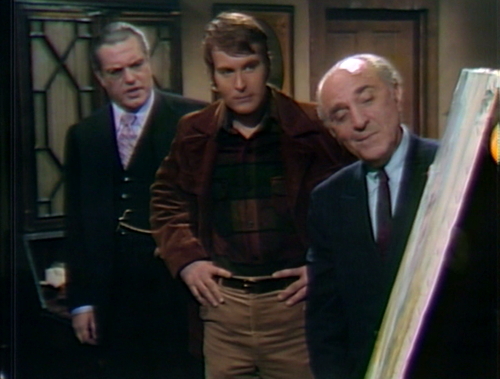 Professor Henry Osmund is played by Ronald Dawson, in the first of two appearances on the show. He also appears in July 1970 as Ed, a records clerk in the far-off space year of 1995. This is close to the end of Dawson’s career; he first appeared on TV in 1949 on The Philco-Goodyear Television Playhouse, one of those early-TV “point the camera at a stage play” shows. In the early 50s, he appeared on TV in The Big Story, Martin Kane, and I Spy. From 1954 to 1956, Dawson was in the original Broadway cast of the Agatha Christie hit Witness for the Prosecution, and spent a couple months in the Broadway cast of The Sleeping Prince. In the 60s, he appeared on several soap operas — The Doctors, The Edge of NIght and Dark Shadows. He had a small part in the miniseries The Adams Chronicles in 1976, and then retired. 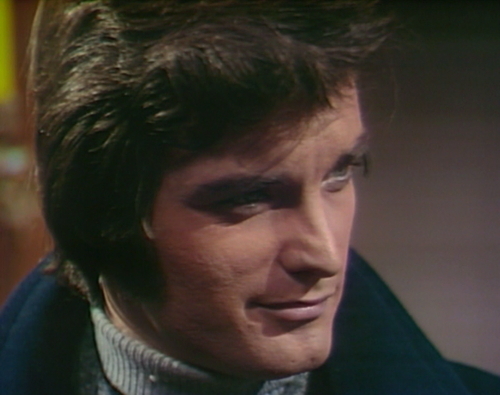 There aren’t any cast credits today, but the character is listed in The Dark Shadows Almanac and The Dark Shadows Program Guide as Henry Osmund, rather than the more familiar spelling, Osmond. Today’s post was constructed from actual lit-crit jargon, which I learned in college in the early 90s and never had a chance to use before. Despite all appearances, if you know the jargon then it does actually sort of make sense, to the extent that post-structuralist literary theory ever makes sense. If you’re interested, and there’s no reason why you should be, there’s a helpful Semiotics for Beginners glossary that would have done me a world of good when I was a sophomore. However, there is one word in the post that I made up myself. See if you can find it! If Amanda Harris/actress Olivia Corey is supposed to be about 20 years old in 1897 when she was “born” into life by painter Charles Delaware Tate, then she must now be about 20 + 72 more years, which would put Amanda/Olivia at about 92 years old at this point in 1969. So, at the very end of this episode, I expected to see the face of a nonagenarian underneath the landscape when art expert Mr. Osmund removed the top layer of paint, but no. Instead what we see is Amanda Harris’ still young-looking face! Therefore apparently the rules of Tate portraits that apply to Quentin’s portrait don’t apply to hers. On the one hand, Tate’s portrait of Quentin (like Dorian Grey’s portrait) gets old and ugly — and even morphs into a wolf on nights when the moon is full — while Quentin the man remains young and handsome. But on the other hand, the same cannot be said for Tate’s portrait of Amanda Harris. Neither Amanda/Olivia the woman nor Tate’s portrait of her seem to age at all. Her portrait somehow stays as young as she does! How can one explain such an anomaly as this? Quentin was a real hunk of real human flesh when Tate painted him whereas Amanda was just a figment of the painter’s imagination. When Sam Evans ‘aged’ the portrait of Angelique, her physical appearance changed. Shouldn’t Olivia have a landscape tattooed on her face now? Well, Amanda wasn’t born naturally like Quentin: she’s a static image come to life. The reason she doesn’t age is because she wasn’t ‘human’ to begin with. Because Amanda for all intents and purposes IS the painting, an inanimate object given life similar to the statue from the Pygmalion myth. Quentin’s portrait on the other hand was created specifically with the goal of containing his warewolf curse and make him immortal so that Count Petofi could body jump into an ageless body. Quentin “ages” through the portrait because he is a human being. It is established [spoiler alert] in episode 922 that Amanda had met a mysterious “Mrs. Best,” who made a deal with her–she would remain forever young until the day she was meant to die. If she finds Quentin before then, they will live forever in eternity. She was created because of the painting. So neither age. I’m going with the descriptor, “mendacitist” for the made-up word, although based on “mendacity,” if it’s not a word, it should be! or you could just come right out with it and call her a @#%ing liar! My guess too! It was the one word where I had to perform a Google followed by, “heeey.” Great word tho’. 😛 Yeah, well if you google it you get nothing. Hahaha! Could this be the best blog post ever? You continue to hit the ball right out of the park. And she travels with framed photos of herself! I could understand if the photos were of her WITH someone else. But her own glam shots? Danny, it’s interesting to me that your entry today should be, in effect, a parody of a jargon-laden style of literary criticism (or as you term it, “lit-crit”) from your experience in the 1990s. When I earned my B.A. and M.A. in English in the 1970s and my Ph.D. in American Studies in the early 1980s, literary criticism didn’t seem so jargonish. I believe the emphasis was more on clarity of expression than on semiotics. However, one of my fellow grad students, whose name I forget, was really big on “semiotics” (a word I don’t believe I had ever heard before she uttered it in my presence). She spoke in a lot of jargon, too. I distinctly remember the reaction of a certain professor following one of her semiotic ramblings: “I have to confess, Ms. ______, that I haven’t the faintest idea what you just said.” I got an A in the course; I have no idea what her final grade was. Yeah, this post is both a spoof and a love letter to my literary theory days in the early 1990s. The ideas expressed in post-structuralist theory are legitimately compelling and fun to think about, and now that I think of it, some of that definitely informs my writing on this blog. 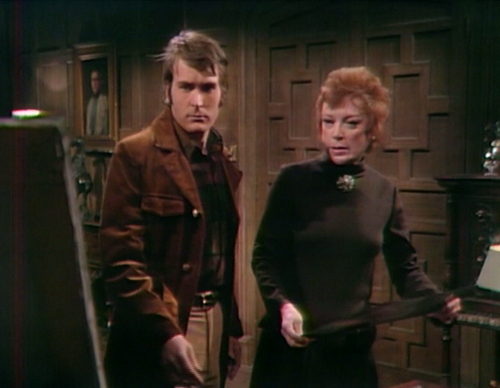 When I speculate about how the audience understood Dark Shadows in the context of what else was going on in the 1960s, and when I talk about how I used to see the show when I was young vs how I see it now — that’s semiotics. The idea that people “read” a text in different ways, or in ways that the writers/producers didn’t intend, comes from this kind of literary theory. One of my favorite examples is Eve Kosofsky Sedgwick’s 1990 book “Epistemology of the Closet”, which I reference in the title of today’s post and in the first couple paragraphs. It’s one of the big texts in “queer theory,” a movement that was very important to me in the early 90s, when I did a lot of gay activist work. “Epistemology of the Closet” was basically the intellectual foundation of the gay rights movement at the time. So the boldness of a statement like “An understanding of virtually any aspect of modern Western culture must be not merely incomplete, but damaged in its central substance to the degree that it does not incorporate a critical analysis of modern homo/heterosexual definition” — the grand sweep of that sentence is funny to me now, but it was a historical moment when we needed some bold statements. I have great affection for that book. But — unfortunately, the interesting and useful ideas in this kind of writing were (and are) swamped by impenetrable jargon and intentionally confusing sentence structure. Literary academics are so concerned with looking smart that they deliberately write badly, to impress each other and keep normal people away. Not only is Olivia’s hotel suite festooned with head shots of herself, but they are all yellowed and aged-looking. Weird. Just a quick question about that portrait of Amanda Harris – didn’t Judith Trask wall it up in the West Wing along with her ever lovin’ husband Gregory? In other words, how did Tate get hold of it again so he could slap a tacky landscape over her face? It was established that Tate had made several portraits of Amanda. Yes…but why paint over the portrait of Amanda? Maybe he just ran out of canvases and recycled.